The Vibrams (at least most of them), and the Altra Adam, have absolutely no tread. Think of a racing slick. Though for road running, it's probably not so much of a problem (shoes won't hydroplane). Slightly less traction in wet conditions, but "less" never would get to be "not enough" unless you're on something like wet paint stripes or man-hole covers or ice, in which case nothing would help. Lugs? Many of the Inov-8 line have very aggressive lugs. But once they get past just a few millimeters, they become a detriment on hard surfaces. Even on snow, it's amazing how little tread it takes, depth-wise, to get good traction. I think it's interesting to think of Nike's originals being made on a waffle iron... what would they look like? An inverted tread. I'd think that would pack up rather easily if the inverted parts were too small. But I'd want a sole that cleared easily, tread that wasn't very deep, maybe a modified inverted waffle-like pattern. It would need to be fairly continuous. One of my beefs with the Saucony Kinvara is that the forefoot lugs on the outer edge aren't covered by carbon rubber. These are the lugs that make first contact with the ground in a forefoot or midfoot strike, and also take most of the abrasion. Years ago, several shoe companies were using a “blown rubber” outsole to make them lighter and more cushioned. What they also did was make them MUCH less abrasion resistant. The next tr end was using carbon rubber in only the high-wear areas, namely the heel for most shoes. I think this is exactly the WORNG place, especially in a shoe made for mid- and fore-foot landings, and New Balance hasn’t gotten this idea yet. Their Minimus Road shoe uses a carbon block in the heel only. I think if they added carbon rubber to the forefoot, especially along the outer edge, they would go a long way towards having a winner on their hands. I think the coming Altra Instinct has an almost idea sole, as far as tread pattern goes. 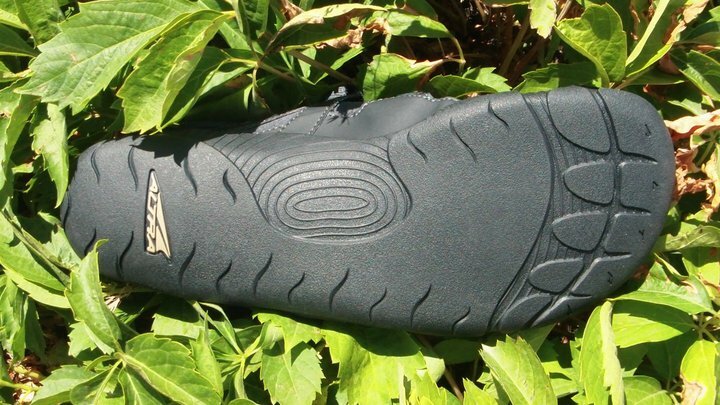 It’s hard to tell from the Altra site and the pictures whether it’s made from carbon black rubber or if it’s a grey colored material (meaning less carbon – softer). I’m also intrigued by the New Balance Minimus Trail sole, and I’ll have to reserve judgment on that one until I can try it on – I think it may not be as suited for the road. Next, I’ll take a look at the midsole – in many ways, the “heart” of a shoe.